The Wisconsin Pottery Association started working on the 2007 exhibit at the 2006 Show & Sale. Members ask dealers and each other what they would like to see. After some discussion over the fall, the group started to come together on having Fulper as the subject of the exhibit. At first there was the debate if we could bring together an all Fulper show. It was determined that we could do an all Fulper show, just like our past single company shows on Roseville and Weller. Others then talked about the other potteries that could be shown which might never fit in another show. Others added that it would be a learning experience for many members and the public to include these other potteries. 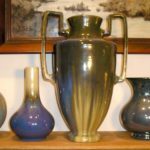 New Jersey was a center of pottery production starting in early colonial times because it was blessed with generous clay deposits of several types necessary for quality pottery & porcelain. Lois Lerner identified over 130 companies with production in New Jersey in her book Lerner’s Encyclopedia of US Marks on Pottery, Porcelain & Clay. Today’s exhibit will focus on the art pottery of the 20th century, excluding the large quantity of porcelain & dinnerware production. Samuel Hill started Hill Pottery in 1814 in Flemington producing redware & later stoneware. In 1860, two years after Hill’s death, the company was sold to Abram Fulper, a long term employee. Following Fulper’s death in 1881 his sons George, William, Charles & Edward ran the company. It was at this time the Fulper name appeared in several forms. The company was incorporated in 1899 as Fulper Pottery. 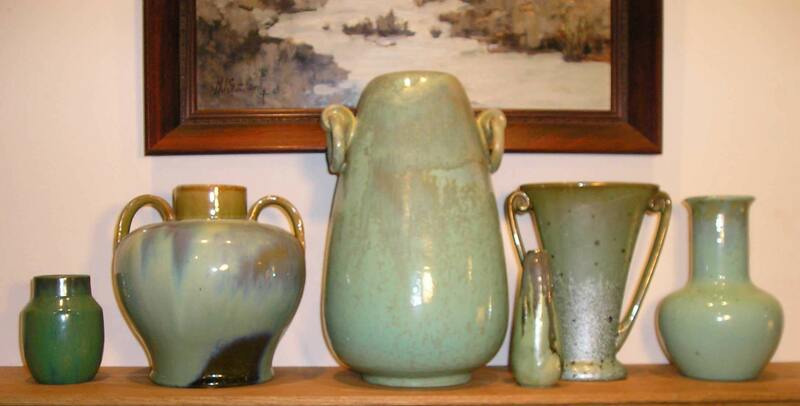 After several years of preparation, Fulper introduced the Vasekraft art pottery line in 1909. A wide range of shapes & a very extensive array of glazed were featured. 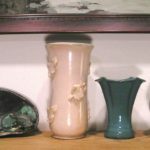 Crystalline glazes in many colors decorated production vases & bowls for the first time. Shapes ranged from very “Arts & Crafts” to ancient Greek & Roman as well as Ming Dynasty. 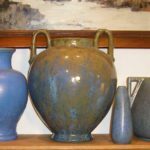 Fulper’s real claim to fame & the delight of collectors is its glazes. 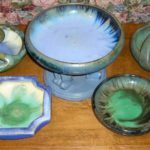 Glazes such as Famile Rose, their premium glaze, Elephant’s Breath, Butterscotch Flambé, Flemington Green, Leopard Skin, Mirror Black & today’s favorite Copper Dust impressed the industry & collectors. J Martin Stangl joined the company as superintendent of the technical division of pottery by 1911, the same year William Hill Fulper II retired. Under Stangl’s direction many new glazes were introduced & the company prospered. Fulper received many honors including an award at the 1915 San Francisco Exposition which was advertised in a label on many pots. 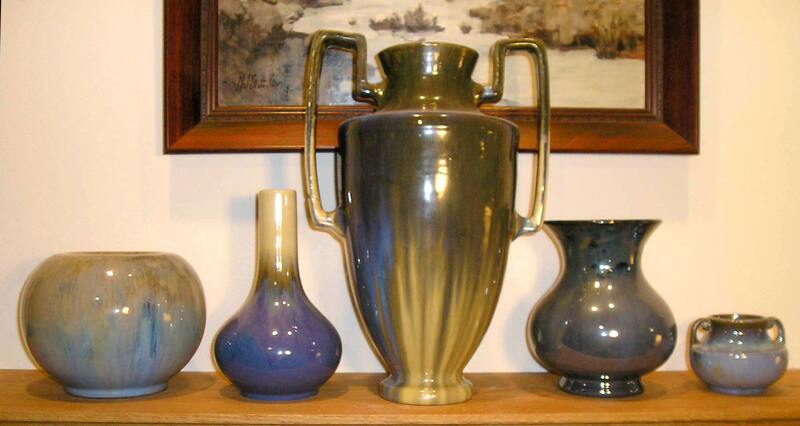 Stangl went to Haeger Potteries in 1915 where he launched their art pottery lines. He returned to Fulper in 1920 to manage the firm. In 1928 Fulper opened a new plant in Trenton. In 1929 the main plant in Flemington burned to the ground destroying most of the finished stock. That same year Stangl consolidated the Fulper divisions with the Stangl Ware to form Stangl Pottery. Fulper pottery is usually clearly marked with various “FULPER” marks. Many early pieces were marked Prang, after a large department store dealer. Most Fulper pottery is molded. Jersey City Pottery refers to a number of potteries from 1827 to 1892. The art pottery marked with an I.V.W. was produced from around 1880 to 1892 when the buildings were torn down. Five potteries in Trenton worked together to form Trenton Potteries in 1892. The Crane Company which was & still is a large toilet & sink manufacturer was involved in the Trenton Potteries business. In 1950 the Trenton Potteries were dissolved & the manufacturing facilities were absorbed into the Crane Company. 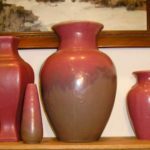 The majority of the art pottery production was in the 1930’s & 40’s. 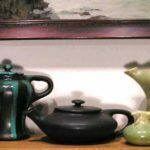 Trenton Pottery is characterized by its dense white clay, undecorated & great lively colors. Some wonderful art deco shapes were used. Poillon Pottery was organized in 1901 & incorporated in 1903. Clara Poillon, her husband William, her sister in law & James Andrews were the owners. The early output of the pottery was all art-ware. The Poillons lived in New York City & exhibited in many competitions there. Earthenware molded pottery was decorated in orange, yellow, green & blue luster glazes developed by Clara Poillon. Later production moved to tiles & lamp bases. Clara Poillon retired from business in 1928. She continued to exhibit until her death in 1936. The mark is a conjoined clP. After closing the Volkmar Pottery in Corona NY in 1902 Charles & Leon Volkmar opened the Volkmar Kilns in 1903 in Metuchen. 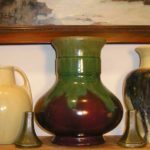 Both of the Volkmars taught pottery & glazing in Metuchen. Leon took over the pottery program at the Pennsylvania Museum of Industrial Art but continued to work with his father. Leon left in 1911 to start Durant Kilns with Jean Rice. Charles continued until his death in 1914. Typically a matte glaze in an arts & crafts fashion marked with a V.
Clifton Art Pottery was established in 1905 by Fred Tschirner, a ceramist educated at the University of Berlin & the University of Michigan & William A Long, an organizer of Lonhuda Pottery in 1892 & the Denver China & Pottery Co in 1902. The Crystal Patina line was a dense white, almost porcelain clay with green to gold glazes which were sometimes crystalline. A second line introduced in 1906 was Indian Ware, with its red clay bodied decorated in black & styled after traditional Indians potteries. Several other lines were introduced including Tirrube. All Clifton pottery was molded. Long left Clifton in 1909 & went to work at Weller. He later worked for Roseville & American Encaustic tile. He died in 1918. Art pottery production ceased in 1911 when the work shifted to porcelain fired wall & floor tile. Clifton was marked with CLIFTON in block letters, CR conjoined, Clifton in script, Indian tribe names & shape numbers. Many pieces are unmarked. Metone appears to be Fulper unglazed blanks covered with a copper alloy coating similar to Clewell. Only earlier shapes seem to have been used. 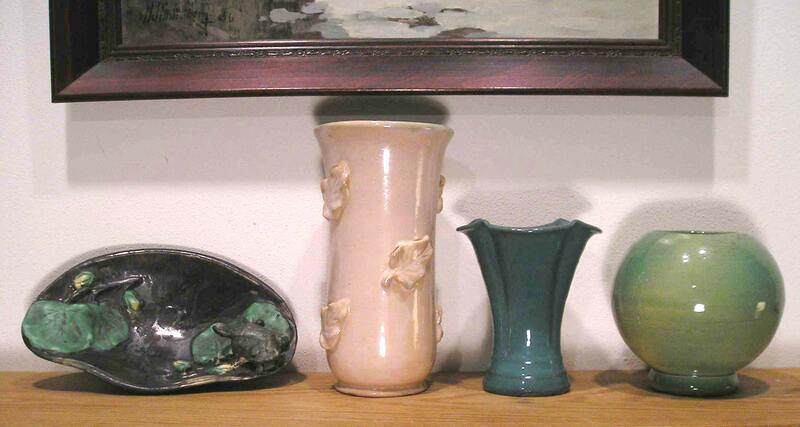 Pieces are probably circa 1915-1920. 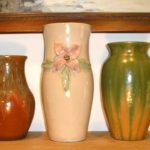 Mountainside Pottery was started by John Kovacs. Kovacs was from Hungary & was affiliated with Rutgers University. The pottery was made of cream colored clay & was hand thrown or molded. Several styles of figurines were also made. A wide variety of glazes were also used. Pieces are signed with a hand inscribed conjoined MP. Some pieces were artist signed Maximilian. 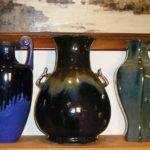 Martin Stangl purchased Fulper Pottery in 1929 & changed the name to Stangl Pottery. Stangl continued to use the Fulper name & shapes but added new shapes & modern glazes. In 1931 the popular Sunburst or Rainbow glaze was introduced along with new shapes. With the legalization of alcoholic beverages in 1933 Fulper/Stangl production was revitalized with beer mugs & steins. Dinner ware & kitchenware became the leading products in the mid-thirties along with lamps. Production at the Flemington plant continued to be called Fulper until the plant was closed in early 1935 & turned into a factory store known as the Flemington Outlet. In 1937 large scale hand decorated dinnerware production began. In 1939 production of bird & animal figurines began. In the 1940’s dinnerware & birds were in great demand. Solid color dinnerware was discontinued. In the 50’s production was modernized increasing production. In 1965 fire destroyed almost half of the Trenton factory. Due to a good insurance policy, Stangl was up & running 6 weeks after the fire. 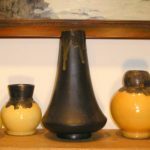 Martin Stangl passed away in 1972 at the age of 84, up to the end the force behind Stangl Pottery. Stangl was purchased by the Pfaltzgraff Company in 1978. Stangl was signed in various ways with “Stangl” in the mark. Francis Joseph Von Tury was born in Hungary in 1901. He studied ceramics in Budapest & in Teplitz. From 1926 to 1936, he worked as a technical advisor in Europe & the USA. By 1936 he had started his own pottery company. 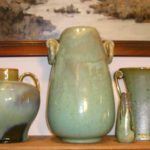 He was a prize winner in the 1939 National Ceramic Exhibition in Syracuse NY. He used high fired decorated porcelain. He is mainly known for vases & lamps but also made tiles & murals. Wares are signed Vontury. References: Lerner’s Encyclopedia of US Marks on Pottery, Porcelain & Clay (Lois Lerner) Art Pottery of the US (Paul Evans) Collector’s Encyclopedia of Stangl www.modish.net. 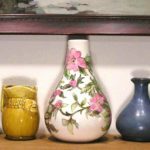 Odana Antiques and Fine Art Center – Madison. Below is just a sampling of the pottery that was on display for one day only.